Manihot Esculenta L - Cassava. 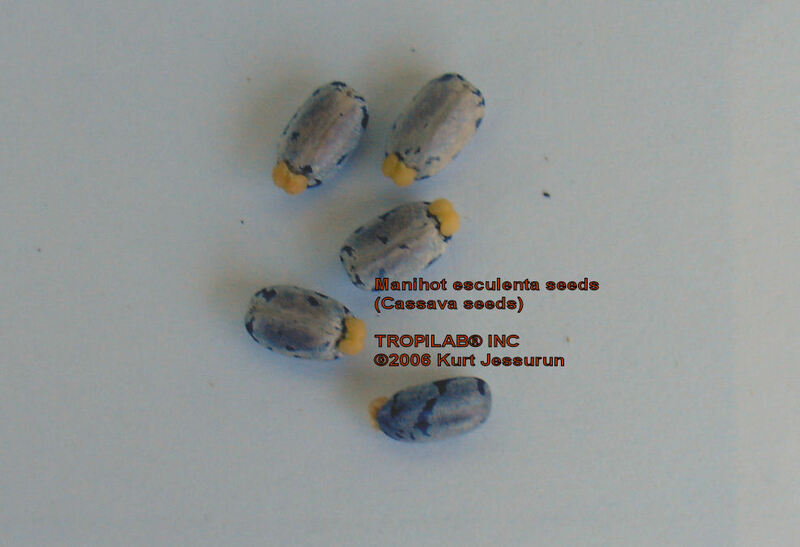 MANIHOT ESCULENTA L. - CASSAVA. Cassada, cassava, cassave, imanoka, kasaba, katela boodin, maniba, mandioc, manioca, maniok, muk shue, shushu, tapioca, tapioka, yuca. 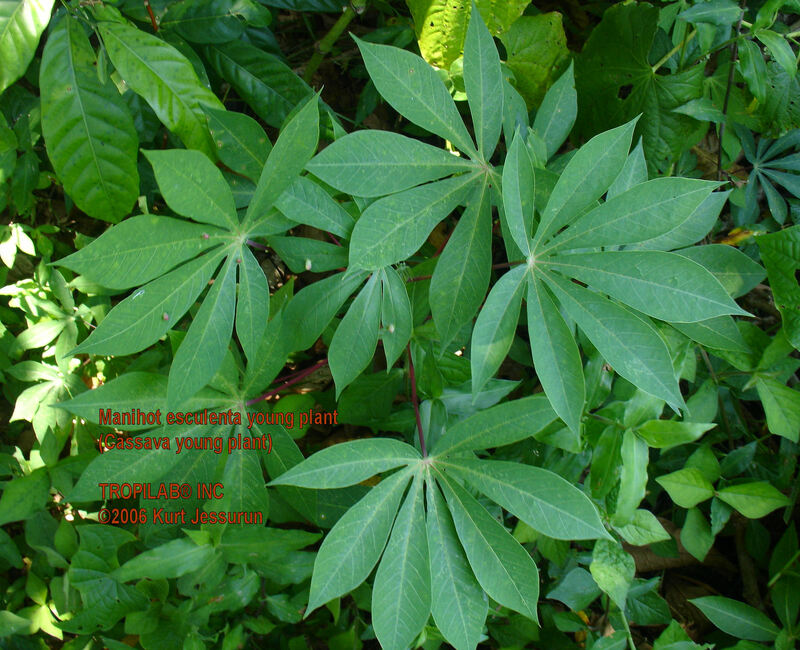 Cassava is a tropical perennial shrub of approximately 6 feet tall. It has palmate leaves, sometimes green flowers and a brittle stem. Vegetative propagation is done by cuttings from the stem. 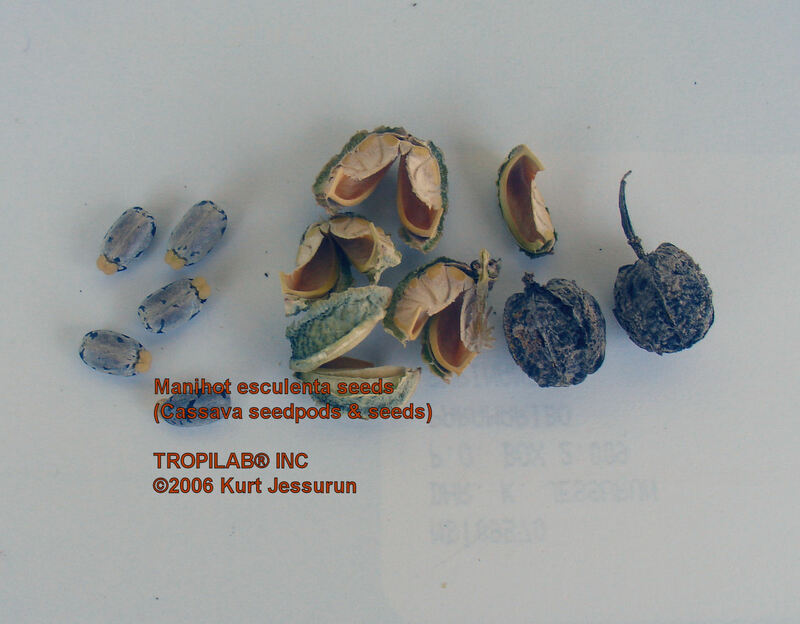 The fruit is round or oblong and winged; each fruit contain 3 seeds. 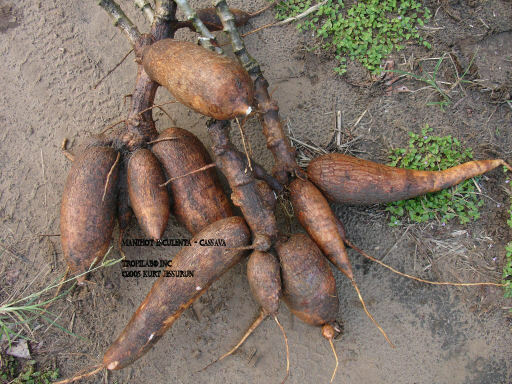 Cassava is grown for its enlarged starch-filled tuberous roots. 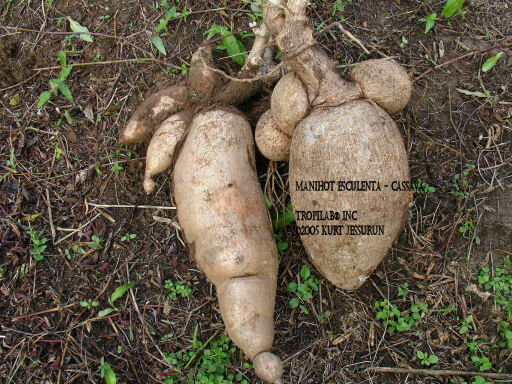 There is a bitter, poisonous- and a sweet, - nonpoisonous variety of cassava; however the skin stays poisonous and the sweet variety should be peeled. There are hydrocyanic glycosides (HCN) in all parts of the plant; these glycosides are removed by peeling the rhizomes (tuberous roots) and boiling these in water. The peeled roots of the sweet variety are usually eaten cooked or baked. The root of the bitter variety is very poisonous when raw. Cooking destroys the hydrocyanic acid; the cooking water must be discarded. The cassava is native to South America. The young leaves are used as vegetable and contain a high amount of vitamin A and C.
The bitter ones are grated, diluted in water and pressed in a cylindrical basketwork "press" to extract the juice. The paste of cassava is baked into pancake-like bread while the extracted juice is fermented into strong liquor called Kasiri. The juice can also be concentrated and sweetened until it becomes a dark viscous syrup called kasripo (casareep). This syrup has antiseptic properties and is used for flavoring. The Amerindians use the brown juice, obtained during processing, against burns. Full sun / light shade, sandy loam, should be constantly moist.